1. I executed my well thought out plan for what we needed. I had it all written out and waiting for my hubby to get paid. No spur of the moment shopping. That is what kills me. 4. We ate at home and we froze the leftovers that we wouldn’t be able to eat quickly with Easter approaching. 5. I did all of my grocery shopping at Aldi. They even had a nice spiral sliced ham and a shrimp ring that my family will enjoy for Easter. How about you, what have you done to be frugal this week? I shop on Fridays, just so you know. 1. I went to Costco to get a few supplies and I found low carb bars that I can eat for breakfast for $19.99 for 24 bars. That is 83 cents per bar. My Adkins bars are $6.96 for 5 bars. That is $1.39 per bar. I bought them and I will save 56 cents every day! 2. I stayed home all week and didn’t shop at all until payday. 3. I made all meals at home. We ate all leftovers too. 4. My husband ordered a part to fix my Oreck vacuum himself instead of taking it in to the vacuum repair shop. They vacuum shop quoted me $35 and my husband was able to fix it for $9 (with shipping)! 5. I planned all of our meals for the next week and shopped minimally to help save money to pay for the upcoming taxes which are due in just a couple of weeks. How about you, what did you do to save money this week? Melissa at House Full Of Searls, posts her frugal adventures, so I thought I would too. 1. We ate at home all week and we didn’t waste any food. 3. I worked on my goals and I had to stay home to do them. 4. I made a loaf of bread in the bread machine to use up some candied fruit that we had in the refrigerator. 5. I made vegetable soup out of some older veggies that I needed to get rid of and it turned out great. What about you, what did you do to save money this week? Melissa is back at it. She has her new post up about her frugal week. Here are my top 5 frugal things that I have done. 1. We ate up the leftovers before my parents got here. 2. I mended a mattress cover instead of buying a new one. 3. I cut way back on Easter candy. Better for the budget and better for the kids teeth. 4. I drove my husband’s car when he was home to help save gas money. 5. I continued Spring cleaning. This helps me to know what I have and where it is which saves me money. What about you? Were you frugal this week? 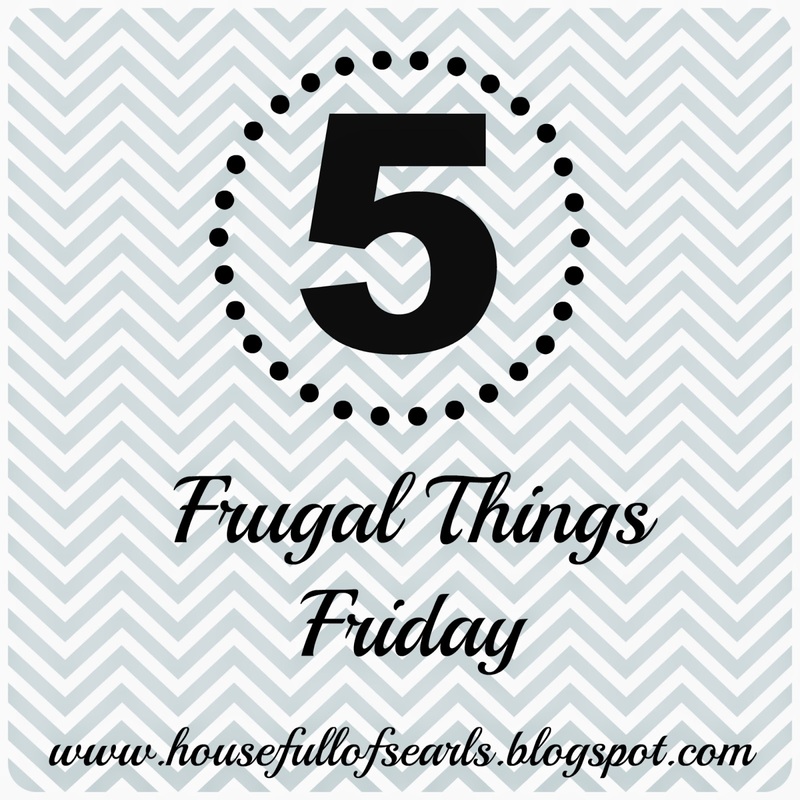 Melissa at House Full Of Searls has updated her frugal things for the week. 1. I didn’t grocery shop this week at all. 2. I tried a couple of new recipes this week. They didn’t use any special ingredients. I used leftover ham to make a ham casserole that my family really liked. 3. I polished my shoes this week. I was thinking that I needed a new pair of shoes since mine were looking so rough. After I polished them, they looked great! No need for new shoes. 4. I was buying some household supplies at Wal-Mart and saw bread on the reduced rack and bought 10 loaves at 40% off. They were either $1.01 or $1.18 for each loaf. This is a real help to me. Yes, I could make it myself for a little cheaper, but I have time constraints most of the time. I only buy it when it is on clearance. 5. I stayed home and started Spring cleaning. I am getting a bunch of stuff ready to give to Goodwill. How about you, did you do anything frugal this week? Melissa at House Full of Searls has a post pretty much weekly about 5 things that she did that were frugal. I love reading what she is doing and thought I would join in with her and highlight 5 things that I did that were frugal this week. 1. We ate at home all week. 2. I took the kids to the Y to get out of the house. We pay for the membership, we might as well use it. 3. I shopped at Aldi with my menu planned, and I didn’t make any other stops for groceries. 4. I used one of the many hams that I have in the freezer and made ham and bean soup. It stretched out over 2 meals. I am trying to clean out the freezer so that I can defrost it in the near future. This killed 2 birds with one stone. I love when that happens. 5. I stayed home most of the mornings this week so that I could keep up with the house work. What about you, what did you do that was frugal this week?